Product prices and availability are accurate as of 2019-04-23 14:46:23 UTC and are subject to change. Any price and availability information displayed on http://www.amazon.com/ at the time of purchase will apply to the purchase of this product. Continuing the story line of Arcadia’s Children: Samantha’s Revenge, this futuristic sci-fi tale brings back Mick Tarmy and a cast of characters guaranteed to create a fascinating journey to destroy a plantation dedicated to growing zuka milk, which produces a powerful narcotic street drug. The Great Ones, who use the drug to raise funds for their war against humanity, will go to any lengths to stop Mick, his cohorts Claire Hyndman and Nonie Tomio, from their mission. Journey through a world filled with aliens, robots and clones in this book that is a cracking good read for all ages. This book is a wonderful sequel to Arcadia’s Children: Samantha’s Revenge published this past year. And Tarmy and Samantha return too! This is a great story. Mick Tarmy finds himself in a situation that takes his breath away. It isn’t his fault, but it is what it is and now he has to deal with it or he will be in even more danger. He is still carrying the burdens of being thought of as a deceased criminal and outlaw. He is hated and loved by people around him. This is a combination that makes his life really hard to get his mind around. And it is dangerous at every turn, both to him and his loved ones. However, the people who hate Tarmy have evil schemes hovering in the background. They would like to kill him. They don’t care how many people Tarmy cares about and loves get hurt in the process. But most importantly, they are also after his daughter, Amanda. This is something he can’t fathom and put up with. So the tension is at its highest at this point in the story, drawing the reader even more deeply into the narrative of the book. Tarmy starts to take all of these hardships personally, and he falls into a deep melancholy. However, he cannot allow himself to resist fighting because Samantha is hovering in the background, ready to pounce and make the situation even worse. I love Williams’ way of creating plot lines within plot lines. He is a master storyteller, someone any writer might want to emulate because of the depth, breadth, honesty and sincerity of his writing. I loved this story from start to finish! I will definitely be recommending it to my friends who love thrillers. I can’t wait for his next book! The much-awaited sequel to Samantha's Revenge, Arcadia’s Children 2: The Fyfield Plantation is finally here. Of course, I picked it up right away. I wanted to know what happened. It's one of Andrew's inherent abilities to pull you into the story and make it realistic like you're living in the Arcadians’ world! And yes, finally, the havoc wreaked by Samantha has come to an end, or has it really? I thoroughly enjoyed the sequel and loved every bit of screen time Tarmy got. Besides Tarmy, I also loved Wren in this book. I loved every minute of their journey, and the author made the plot interesting without a lot of technical jargon that's difficult to understand, so anyone can read and enjoy this book. Needless to say, the journey was enticing, exciting and exhilarating. Can't wait for what the author comes up with next! Want to know what happened? Not giving any spoilers…you'll have to pick up the book and read. But I promise it's worth it! There are books you desperately want to get your hands on and this was that book for me, the continuation of the journey that started with the first in the series. I waited so long for this sequel and honestly, it has been worth the wait. The author did justice to my expectations. This book is a world of magic and suspense. It took me to a magical world yet again, an escape that I always seek whenever I pick up a book. Reading for me is like breathing and a book well-written is an addiction and a weakness. I rarely read sci-fi, but this book was most definitely worth it. It is a sci-fi thriller that kept me hooked till the very end. It was fast-paced and most certainly would not let you get bored. I finished it in one sitting. There are absolutely no boring moments; it is a total page turner and totally recommended if you are into sci-fi or you are looking to try this genre. This series is highly recommended for people who are new to the genre of science fiction. If you want your friend to join your fandoms from the science fiction world, this is the place to start. I was very pleasantly surprised. This book is exciting, stimulating, and totally captivating. I honestly loved the writing style of the author. It was easy to understand and very smooth. It was just perfect. The writing style and an amazing plotline made it my new favorite and the point of my obsession. The plot twist left me staring at a wall, mesmerized. This book is exactly what I need; after all, who could say no to such an exceptional read? It was thrilling and fascinating. It is extremely hard to find a book that is worth your money anymore; this will totally make every single penny worth it. This is the book you can put on your shelf and cherish forever. I won’t think twice about rereading it. It is very rare that I reread a book but this I definitely would, without a second thought. Careful, it'll keep you up all night, totally hooked, but be assured it will be totally worth it. If you are looking for book recommendations to gift to a book lover, this book series will be your perfect option. I am anxiously waiting for more books by Andrew Williams. 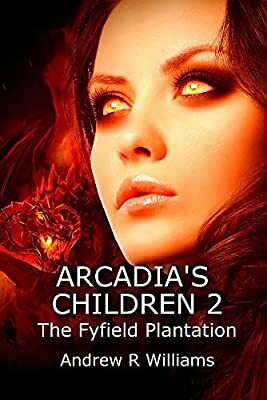 Arcadia’s Children 2: The Fyfield Plantation is a sequel to Arcadia’s Children: Samantha’s Revenge. You’ll find many familiar faces in book two, including Tarmy and Samantha. I like way the sci fi elements are handled in the book. I don’t like a lot of technical jargon and too much complicated explanations of technology, and you don’t get that here. It’s straightforward and easy to read. Don’t worry, though. You’ll be in no doubt whatsoever that you’re in another world. I also like the author’s writing style. It flows easily and logically and keeps the scenes moving along. That’s another thing I like about the author’s writing. The book is fast paced and all the action keeps you reading because you can’t wait to find out what happens next. The plot is skillfully crafted and I didn’t always see what was coming. Williams is a good storyteller who makes you care about the outcome of the book. If you’re a sci-fi lover, I’d highly recommend Fyfield Plantation. In real life, Andrew R Williams is a chartered surveyor. When twilight falls, he starts writing. Andrew has written two technical books: Domestic Building Surveys and A Practical Guide to Alterations and Extensions. Arcadia’s Children 2: The Fyfield Plantation is his second novel. He is currently working on another sequel. Andrew lives in England, UK and is married to Geraldine. Hobbies include writing, basic astronomy and having a good time. He’s an active member of the local Business Network International group.